Learn from fiber artist, shepherd, and entrepreneur Natasha Lehrer Lewis, of the journey she took in finding her passion for creativity. Candid memories, stories and laughs, along with hands on demonstrations of felting and spinning, will inspire you! Step inside her world of art, agriculture and education that enriches our community. 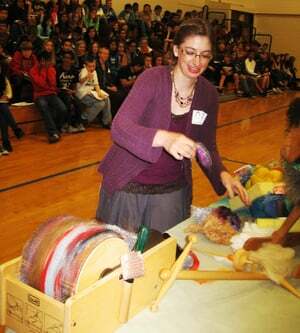 Her presentation includes spinning demo and a participatory wet and needle felting demo. Natasha will answer questions about art, entrepreneurship, and creativity.